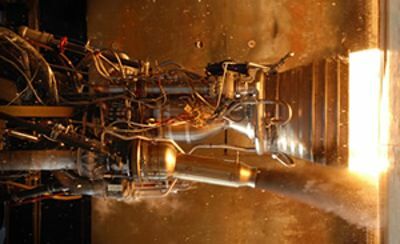 The engine looks good to Stewart Money at Space Review. 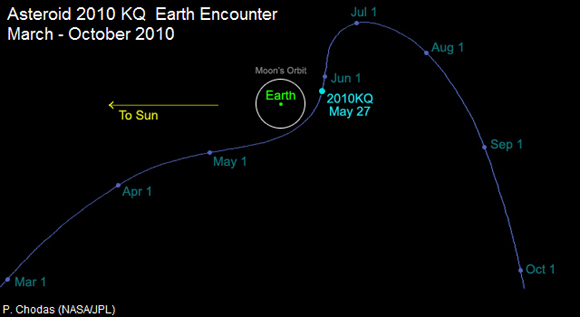 Object 2010 KQ was detected by the Catalina Sky Survey in Arizona earlier this month, and subsequently tracked by NASA’s asteroid-watching service, the Near-Earth Object Program headquartered at the Jet Propulsion Laboratory in California. The mysterious artificial object has apparently made a close pass by the Earth, coming in almost to the distance of the Moon’s orbit, and is now headed away again into the interplanetary void. The object has used no propulsion during the time NASA has had it under observation. However the spacewatch boffins believe that it must have moved under its own power at some point, given its position and velocity. Good reportage from The Register on the huge success of Elon Musk’s maiden launch. First launches of rockets have a poor success rate (for obvious engineering reasons). Bullseye, indeed. 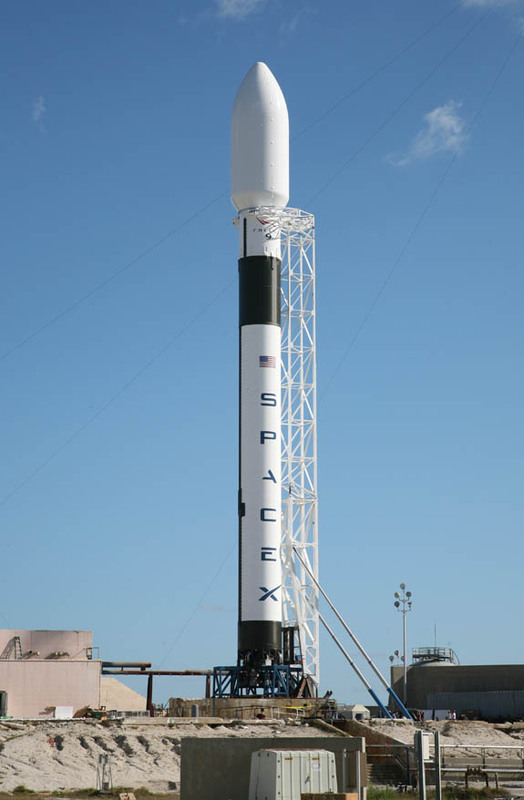 Musk had earlier said that merely achieving orbit on the Falcon 9’s first flight would be “100 per cent success” — and his two-stage, 54.9m (180ft), liquid oxygen and RP-1–fueled rocket’s payload, what Musk described as “structural test article of ourDragon spacecraft,” is at this moment zipping merrily about the globe, enjoying that success. And success on a maiden voyage is unusual. According to a BBC report on the Falcon’s feat, two-third of rockets introduced in the past 20 years have had unsuccessful first flights. Big congratulations to the whole SpaceX team. Please continue reading The Register coverage. I recommend the status report on ballistic missile defense systems being developed around the world – by Taylor Dinerman. Yet, as BMD systems proliferate, these satellites will be used principally to detect, track, and target ballistic missiles. This distances them from the world of intelligence and a Cold War-type nuclear exchange and makes them instruments of a new kind of missile warfare. Within a decade we could see war plans that depend on the early elimination of missile tracking satellites in order to degrade the enemyâ€™s BMD capability. Defensive plans will be made to counter these attacks. In the absence of space-based BMD weapons such as the old â€œBrilliant Pebblesâ€ infrared-guided LEO based satellites, missile defense and space war are intimately linked. To imagine that an attacker is going to ignore space-based sensors and allow the target nation or force to employ its defense system at maximum efficiency is to ignore the lessons of history. 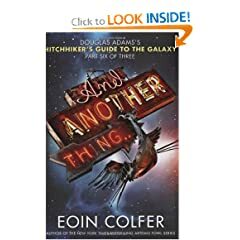 Colfer has not tried to ape Adamsâ€™s style, though, so while And Another Thingâ€¦ takes up the quirky characters â€“ reassembles them, in fact, after the Vogons left them in tiny bits at the end of Mostly Harmless â€“ and sends them on a journey that takes full advantage of the Infinite Improbability Drive, the twisting sentences that are quintessentially Adamsian are missing. I first read the Hitchhikerâ€™s Guide in my late teens when Ted Roche, a libertine friend of mine, pressed it into my sweaty palms and hissed at me with fanatical intensity that I must read it or be ridiculed forever by the school literati. Relax, dude, I remember saying with eightiesâ€™ insouciance. Ridicule is nothing to be scared of. But I was scared. Petrified in fact. If one was not a sportsman, the only other circle to belong to was the readersâ€™ circle. Places were limited and expulsions were swift and ruthless. If one had not read the livre du jour then one would not be offered book swapsies on Friday. If this happened, then a person might be forced to turn to his own siblings for conversation. So, in this spirit of quasi-persecution I scuttled home after double chemistry and found a quiet bathroom where I could settle down and read what I was certain would be a thinly veiled version of Star Wars. Vogons destroy the Earth and a single hero survives. Please. I could almost write the rest myself. Never have I been so happy to be proven wrong. The Hitchhikerâ€™s Guide to the Galaxy was like nothing I had read before, or since for that matter. If you have read it then you know exactly what I am talking about. If you havenâ€™t then read it now, moron. The problem is the hyperbole puts people off. If itâ€™s so popular then it must be middle of the road, brimming with clichÃ©s and easily digested on the sands of Ibiza. All false assumptions. The Guide is a slice of satirical genius. A marvel of quantum tomfoolery. A dissection of the absurdities of our human condition. A space odyssey that forces us to face ourselves and collapse in hysterics. Imagine if Messrs. Hawking and Fry were locked in a room with the entire cast of Monty Python and forced to write a book which would subsequently be edited by Pink Floyd, then the result would need a lot of work before it could be cut from Douglas Adamsâ€™ first draft. For the next couple of decades I followed the exploits of Arthur Dent and his intergalactic troupe as they stumbled through space and time befuddled and bereft, drinking tea in the face of impossible odds and generally failing to find enlightenment at every turn. Itâ€™s like a quest for the holy grail where the grail is neither holy nor grail-shaped. I travelled with Arthur Dent as he lost his planet, learned to fly, found love, made sandwiches, got to know his daughter, found his planet again briefly and finally got blown to atoms. Blown to atoms! Surely not, but no need to panic, Douglas Adams would surely reassemble Arthur somehow in the next book. Colfer: I know Douglas said he was going to do a sixth book, so he had planned to bring it back. And thatâ€™s what Jane, Douglasâ€™s widow, wants. Itâ€™s already working! Sales apparently have gone back up already, and they released the radio show out to iTunes now. So Hitchhikerâ€™s has already been brought back a little bit by this, and Iâ€™m really hoping that when my book comes out people go back and check them all out. And theyâ€™re re-releasing the first one, I think, in a young adult edition. So weâ€™re hoping that my book will bring Artemis Fowl readers into Hitchhikerâ€™s, and that would be great. And last spring, the California-based Solaren Corporation signed a contract with Pacific Gas & Electric (PG&E) to provide 200 megawatts of power â€” about half the output of an average coal-fired power plant â€” by 2016 by launching solar arrays into space. 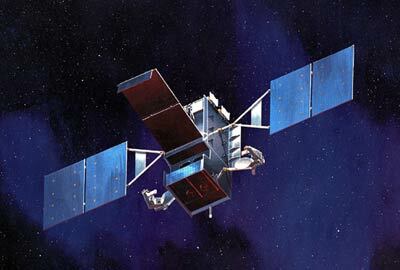 Several other companies have announced their intentions to put up solar satellites of their own. It is plausible that SBSP will become significant in the latter part of the 22nd century. For the next 50 years of zero carbon power we can only count on nuclear plus a small contribution from highly subsidized “renewables”. PITTSBURGH, PA – Nov. 23, 2009 – NASA today selected Astrobotic Technology and Carnegie Mellon University for two contracts to study Moon excavation robots and methods to simulate the one-sixth lunar gravity on Earth. Lightweight excavation robots are key to recovering the water and hydrocarbon deposits at the Moon’s poles, which will enable explorers to “live off the land” rather than hauling all their supplies from Earth at great expense. New results from NASA probes released last week show that the water content in the polar soil is 10 to 30 times richer than previously thought, and in easier-to-access places than the floors of deep craters. Excavation is expected to be required to remove a top layer of dry soil covering ices deposited by comet and asteroid impacts. The lunar gravity simulation study will examine the best ways to mimic the effects of the one-sixth lunar gravity via various active and passive gravity-offload mechanisms and ways to make the apparatus scaleable and transportable for field tests in challenging terrain. (…) the final week of the 2009 Northrop Grumman Lunar Lander Challenge (NGLLC), a competition that is part of NASAâ€™s Centennial Challenges prize program to develop vertical takeoff, vertical landing vehicles like those that one day may touch down on the Moon. For those who were paying attention, the event provided arguablt far more drama and excitementâ€”and even controversyâ€”than the Ares 1-X launch. And, in the long run, the outcome might prove to be as significant, if not more so, than that single launch from the Cape. Entering the last week of Octoberâ€”also the last week of the 2009 competitionâ€”two teams had already qualified for prizes: Armadillo Aerospace in Level Two (see â€œPlaying the waiting (and winning) gameâ€, The Space Review, September 14, 2009) and Masten Space Systems in Level One, after an earlier flight attempt short (see â€œA Xombie over Mojaveâ€, The Space Review, September 21, 2009). But they couldnâ€™t claim the prizes until that hectic last week, with three teamsâ€”BonNova, Masten, and Unreasonable Rocketâ€”planning flight attempts in Levels One and Two. Going into the final week Armadilloâ€™s Level Two flight seemed to be the more secure of the two: after all, no one had successfully flown even a Level One flight before Armadillo made its successful Level Two attempt on September 12. Level Two has twice the flight time (180 seconds per leg) of Level One, and also requires a landing on simulated lunar terrain. Mastenâ€™s successful Level One flight, with its highly accurate landings, though provided an opening, as landing accuracy serves as the tiebreaker. Mastenâ€™s own Level One flight, though, could be bumped from second place (Armadillo claimed first place last year) if another team could perform an even more accurate landing. (…) Mastenâ€™s Level Two success means that all the remaining prize money in the $2-million competition has now been claimed: Masten won $1 million for first place in Level Two and $150,000 for second place in Level One, while Armadillo won $500,000 for second place in Level Two, on top of the $350,000 they got last year for winning Level One. NASA and the X PRIZE Foundation honored the teams in a ceremony on Capitol Hill in Washington last week. â€œWe now have enough cash to get to regular revenue from doing suborbital flights, and possibly even profitability,â€ Masten said. This is very good news. Any serious space exploration effort is much less costly if the moon can be used as a base — outside the earth’s deep gravity well. We can mine many of the required metals on the moon, but the cost of ferrying liquid water from earth is staggering. Suddenly, the moon looks exciting again. It has lots of water, scientists said Friday â€” a thrilling discovery that sent a ripple of hope for a future astronaut outpost in a place that has always seemed barren and inhospitable. Experts have long suspected there was water on the moon. Confirmation came from data churned up by two NASA spacecraft that intentionally slammed into a lunar crater last month.